Fishers Island Club is set romantically on a narrow island that is a mere two miles wide and eight miles long. The island sits between the National Estuary of the Long Island Sound and a series of lakes and ponds. It’s a magnificent watershed where saltwater meets freshwater and it’s a diverse haven for plant and animal life. The course is rather heavenly too, offering the most beautiful and natural water views from virtually every hole. The club was founded in 1927 and Seth Raynor laid out the golf course in a rather links-like style. With numerous stage-like plateaux greens that are protected by cavernous bunkers, the key to scoring well rests with accurate approach play. Gil Hanse has been advising Fishers Island Club on course restoration since 1995. Fishers Island Club measures 6,566 yards from the tips so length is not the issue, the essential element is to keep the ball in play. The rough is brutal and, as we have already mentioned, the bunkering is profound and often penal. Fishers Island is not the easiest course on which to get a game – you’ll need to befriend a member – but stick with it because this is one of the finest and most enjoyable golf courses in the world. Fishers Island is a landmark golf experience that begins with the ferry ride from Connecticut. As you sit there with your clubs beside you, your gaze is drawn toward the island with eager anticipation. For this is a rare privilege that few are fortunate to experience. Fishers Island Club prefers to remain out of the spotlight, yet but one cannot help but extol the virtues of its layout. When driving along, soon after arrival, you see the movement of the land: your sense of anticipation heightens. Finally, you pull up on a rise to the understated clubhouse and take in your first look at the course – the first hole stretching down towards the green beckoning in the distance. Shoes are quickly changed in the small room just off the clubhouse entrance: you just can’t wait to get out on the course. 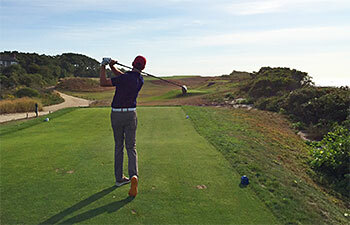 For the newcomer, one may be wary that the course could possibly disappoint – but Fishers Island just steals your heart. As you make your way around the property and glory in the course, the incessant wind, the views, and the golf that is required of you, it is hard to imagine a more delightful place for a game. It is no accident that the charms of this land are captivating. The golf course was a result of a 1925 collaboration of Frederick Law Olmsted Jnr and Seth Raynor. Olmsted, following in his father’s footsteps, became a pre-eminent landscape architect, as well as making significant contributions to the development of the National Park Service. At Fishers Island, he did a remarkable job of integrating home sites and open spaces into the development that became Fishers Island Club. Raynor was a disciple of Charles Blair Macdonald – one of the pioneers of golf course architecture in the USA – and a qualified surveyor with an engineering background when he assisted Macdonald in the creation of the National Golf Links of America. Learning the principles of golf design so well, in spite of never playing golf, Raynor went on to establish himself as a golf course architect. Fishers Island was his crowning achievement. Unfortunately, he never saw its completed form, as he died from exhaustion and pneumonia six months before opening day. At the time, Raynor was in the middle of 30 design projects, surely a scenario that would do little for one’s health. Generally, you will find the course to be wonderfully firm and fast with your ball bounding along the fairways at speed. This will suit you just fine, of course, until an unnoticed contour takes your ball somewhere you didn’t intend. Such are the vagaries of links-style golf and they only add to your enjoyment of the day here. As you think back over your round, the predominant theme is the fun you’ve had had taking on the diverse challenges this course presents. Fishers Island is never far from my thoughts and when I daydream about golf it is here that I most often go. I was very fortunate to be invited to play Fishers Island for the first time a few weeks ago and I think it should be ranked in the Top 10 on every Top 100 list for sure. I flew out from CA just to play FI and I was a little worried it wouldn't live up to the hype because of the non golfers on some of these websites that write negative things about it. To all golfers, do not believe anything negative that is written about FI because it's simply not true. This place is golf heaven and it's Seth Raynor's masterpiece. It's the most fun I've had playing golf in my entire life. I can't comprehend how any real golfer could ever say anything negative about this amazing course. I also played Pebble Beach for the first time this summer and I thought FI was a way better golf course and experience. It's been almost a month and I still think about my round at FI everyday. I can't wait to play it again. No doubt a top 50 course in the world, this is one of the most scenic courses you'll ever play. I played in fall and the fairways and conditioning was great. I loved the classic Raynor template holes and could play this course every day without every getting tired of it. Although I not a big fan of the opening two holes, nine of the next ten holes (the eleventh excepted) are fantastic golf holes, some of the best in the world, in fact. The 335 yard third hole named "Plateau," is a fabulous one. The fairway is set at an angle to the tee, and the hole plays uphill the entire way. The green sits up on, you guessed it, a plateau, which falls off sharply on three sides. It's a great, fun hole with beautiful views. The fourth hole, "Punch Bowl," is without a doubt one of the best in the world. It is 397 yards of delight. Your tee shot has to carry over a ravine to a broad fairway. Your second shot is a blind one over a hill. The hole takes its name from the green, which is true to its name. The approach shot to the green is aimed at a big Fishers Island flag over the top of the hill. It is really exhilarating when you hit a good shot to run up and see where your ball has rolled to and whether it is near the pin. The next hole is world-class also. It's a true terror. A 207 yard "Biarritz," it is on a scale that is hard to describe. Everything about it is big. The carry from the tee is over a big ravine. The size of the green is big. The swale that splits the green is big. The view in all directions is expansive. The bunkering is both deep and oversized. The fescue hazards are big. And more than likely, your score when you walk off the green will also be big. It's a whopper of a hole! The next hole, the sixth, "Olinda" is also a "big" hole. A 520-yard par five, its proportions are outsized. Your tee is over a daunting ravine to a fairway that slopes severely upward. Over the crest of the hill, the incline back down the hill is just as severe. Any shots pulled to the left on this hole would be painful. The hole reminded me quite a bit of the twelfth hole at Shinnecock, which has a similar feel and shape to it. The first time I played Fishers Island it was in quite poor condition, which I thought really detracted from it. Aside from the fairways being really burned out, the sand traps were in poor condition and the greens were bumpy. There is a fine line between 'fast and firm' and not maintained, and the first time I played it, it was just over the line. My second time around the conditioning was great: the sand was in good condition, and the greens were quite good. Fishers Island generates a lot of passionate opinions and it begs the question: should a course with nine great holes and nine ok/good holes be ranked among the top thirty courses in the world? My initial impression was that it was overrated, although, in fairness, I have always said it is a delightful and memorable place to spend a day. While I have for sure upgraded my opinion of Fishers Island upon subsequent visits, I’m still on the fence. Many people have commented to me that the views at Fishers are as good as Pebble Beach, and I don't agree. You can see water on every hole, the argument goes. Old Head has water views from almost every hole also, but does that make it a great golf course in and of itself? No. The knock on Old Head, Tralee, Bayonne, or any number of courses that have great water views is that they don't have great holes. I think there is a lot of confusion about Fishers Island because the water holes blind most people's perception. Water views shouldn't give a free pass to criticism or to questioning whether a course is ranked in the right place relative to other great courses. All water views are not the same. I'm sorry, but looking over to Connecticut, as beautiful as it is, is not the same as looking at Monterey Bay, the Irish Sea or the Tasman Sea. Fishers Island Club is often cited as Seth Raynor’s masterpiece. Certainly Raynor was the beneficiary of a stunning piece of land. And his sinuous routing along the eastern end of the island affords stunning views of both Fishers Island and Block Island Sounds as well as fine golf. Fisher’s is one of only four U.S. courses I can think of with ocean views from every hole. Most of the Raynor template holes are here, though the choice of hole names is interesting. The Biarritz (# 5) takes its name not from the usual swale in the middle of the green (there is a swale but it’s short of the green), but from the trouble one’s tee shot must carry—as at the French original. And the 18th is more of a Road Hole than the 8th, with the role of the railroad sheds played by East Harbor. The green complexes are the most interesting feature here and the course’s stoutest defense—particularly the bunkering, with many 10 feet (or more) deep. Few, however, come into play from the tee. Only at the ninth is the player faced with a choice as to the line of her/his drive. In fact, on half of one’s tee shots (#s 1, 4, 6, 7, 10, 11, 13 15 and 17) there are no strategic choices to be made—any landing spot in the fairway is as good as any other. The lack of dogleg holes (only at #s 3, 9 and 14) contributes to the lack of lines of charm. One thing some may find charming is irrigation. Only the tees and green complexes are watered. As a result, many liken the course to the links of Britain and Ireland (though there is none of the gorse claimed by Larry Berle). This contention extends to the slower greens, which ran at 9 on my stimpmeter in September 2016. But here the similarity ended for me. Unlike links fairways, those at Fishers were bumpy……..I’d have taken four preferred lies had that maneuver been allowed. And the heavy watering in front of the greens made the use of a links-type running shot impossible, despite the fact that Raynor left the front of twelve holes unguarded—to encourage that type of approach. I can think of a number of less renowned Raynor courses (Mountain Lake and Fox Chapel are two that come immediately to mind) I would be just as happy to play. P.S. Instead of hanging around at Silver Eel Harbor waiting for your ferry, why not stop by the Hay Harbor Club for a quick nine? Hay Harbor is the island’s original course and the majority of its members are also members at the Fishers Island Club. You’ll find one of the few courses in the world with vegetable gardens behind half the tees as well as two holes—the second and fifth— that would not be out of place at its more storied neighbor. Sometimes in life you just get lucky. Landing an invite to Fisher’s Island would certainly classify as such an occasion. As most people who dream of experiencing Fisher’s Island know the island is only reachable by ferry, private jet or a long swim. In October when I played the ferry leaves New London, Connecticut either very early, midday or at the end of the day, not leaving many options for those wishing to play golf all day. On our day the wind was up, so too were the swales and this reinforced the likelihood that I won’t be trading golf for sailing anytime soon. Upon arrival at Fisher’s Island there is a short drive to the club of about 10 minutes. There are some houses on the island, but doesn’t seem to be too much else. We couldn’t find but a single store and it was closed. On the way to the club about half way there you run into a driving range alongside the road. This driving range is shared by both Fisher’s Island and Hay Harbor a little private 9 hole course on the island that you also pass on the way out to Fisher’s. If you want to warm up, this is your only chance. The clubhouse is a lovely, classic, understated white building. Think in the direction of Cypress Point or Shinnecock, in fact, they might even all be interchangeable without too much noticeable difference. The course itself is arguably Raynor’s masterpiece. It sits on likely one of the top 10 properties in all of golf. I loved the routing however, there always seems to be some discussion among critics as to whether Raynor really did hit a home run with this A+ property. My experience of Fisher’s was sublime and I would be a strong advocate of his work here. From an aesthetic point of view Fisher’s is nearly unbeatable. The routing runs out along one side of the island and returns along the other side offering spectacular and breathtaking views involving water from every hole. As mentioned we had a windy day with a 3-4 club wind on average and I’d argue this was the ideal conditions to play Fisher’s Island. It was as close to a true links golf experience as I’ve had in the US (outside of Bandon Dunes resort). It was also maintained as such. One of the few courses I’ve seen in the US that wasn’t overwatered and played truly firm and fast as a links course should. On the outward 9, my favorites were 4, 7 and 8. The par 4, 4th hole has a breathtaking view running along the coast with a decent carry to reach the fairway which is raised. In the wind it felt like the target was very small. A drive down the center of the fairway leaves a nerve wrenching blind approach that give you the feeling you are hitting the ball out into the Atlantic. The approach is aimed at a tall flag pole at the back of one of the coolest punchbowl greens I’ve ever seen. In actuality the green is huge and even in the strong wind it was a playable hole but certainly nail-biter by any standards. The par 4, 7th hole plays from up on the hill in the middle of the island down the hill and out towards the bay. It’s a great tee shot that narrows right in the landing zone with water on either side. The approach is played to a slightly elevated green that appears to drop off to the bay on the back side even though this is not the case. It is a theme that Raynor seems to repeat at Fisher’s Island. The par 4, 8th hole presents you with another tight drive (though again it feels tighter than it actually is). The tee shot plays over a very narrow piece of land with water on both sides and even though it opens up a bit in the landing area its an intimidating shot that rewards drives down the right side with better angels for the apporach. The approach is to a diagonally set green welcoming a run up on the right side or ideally a draw. On the back 9 my favorite holes were 11, 16 and 18 although there was not a single hole that I didn’t enjoy. Again, I’d like to emphasize the strong wind we enjoyed on our day which just added a lot to the course for me. The 164 yd par 3, 11th hole played into this cross wind from the left. Hitting this raised green on our day took an amazing strike with a perfectly controlled ball flight that none of us could muster up. All 3 of us ending up in one of the deep bunkers that didn’t allow a view of the greens surface. Also notable from this hole was the beauty of the surrounds with water (not in play) all the way around it. The short 146 yd par 3, 16th was another gem and extremely fun to play with the wind. Perhaps one of Raynor’s most beautiful holes in terms of the setting. I do think without the wind this hole would be a bit easy as the green is relatively flat and large. In the wind it still requires an excellent controlled shot. Finally the 452 yd reachable par 5 18th is an excellent closing hole. The drive tempts you to cut off as much as you can chew with the reward being a much shorter approach from a perfect angle. On our day the wind was nearly straight in our face making this hole unreachable even for most long hitters. However, this hole is a great risk reward closing hole. It is extremely rare to receive an opportunity to play Fisher’s Island. It’s certainly one of the most unique golf experiences on the planet and a course where you finish wanting only to play more. I’d say it’s one of the few courses in existence that I would literally jump on a last minute plane flight from Europe to the US just to head back to for another play. It’s that special! Fishers Island was designed by Seth Raynor in 1926. Similar to Shoreacres and Camargo, the course features those trademark Seth Raynor greens that almost look like they are sitting up on benches. Yet the large, raised, geometric-shaped greens are in perfect harmony with the ocean horizons, and you can see the ocean from nearly all the fairways. Neither the fairways nor the rough at Fishers Island are watered. Only tees and greens are irrigated, so the fairway conditions are completely dependent on rainfall and weather. When we played the course, the grass was dormant and your lie, even in the fairways, was a chancy thing. If you land in a divot, too bad, divots might not grow back until there’s enough rain. As on Shoreacres, there are many ravines, so you’d better know the distances necessary to carry them. The rough is surrounded by gorse, making Fishers Island feel very much like a links course of Scotland –especially with views of the Long Island Sound on 15 of 18 holes. There’s only one fairway bunker, which I noticed because I was in it. It was a clam day, which is unusual on this course, and with the dormant grass on the fairways, you could get lots of roll. When the wind blows, we were told, this course gets some serious teeth in it. This is the best course I've ever played in terms of layout, shot value, fun factor & scenic beauty. Most holes have an ocean view & the wind can be a big factor. There are classic Raynor holes like "The Cape", "Eden", "Redan" and a wild and blind shot "Punchbowl" at ocean's edge. Don't ever pass up a chance to play here. I am fortunate enough to know a member at Fishers Island and I have played here three times now and on each occasion the whole experience was surreal. This is an earthly escape from the drudge and day-to-day reality of normal life. The design is almost overwhelming and a Seth Raynor masterful classic. You won’t get any fluffy lies off these fairways; you’ll need to clip the ball cleanly off the tight turf in a traditional linksy manner. It’s difficult to stay focused with wondrous water views and enthrallingly designed holes. If you get the chance to play here grab it, this is golf in a time warp and pure magical theatre. Wow!